Inbound marketing is the future of marketing in the digital world, and, the future is now. The inbound methodology focuses on bringing prospective customers to you, rather than outwardly seeking them, as you would in traditional marketing efforts; such as direct mail, print advertising and trade show marketing. By creating content specifically designed to entice your ideal customers, inbound attracts qualified prospects to your website and starts the process building relationship. Business-to-business manufacturers don’t want just anyone hitting their website. They want qualified leads who can benefit from their products and services. In marketing terms, you want your ideal prospective customers or “buyer persona”. You can read more of the importance of creating buyer personas here. Once you determine your buyer personas, you need to start attracting those individuals to your company through original, well-crafted content. Blog: The crux of inbound marketing is blogging. A blog is the best way to attract new visitors to your website. How do you get your ideal prospects to find you? By creating educational-oriented, valuable content that resonates, and answers their questions. Blogging allows you to position yourself as a thought leader in your industry and provides you the opportunity to showcase your expertise. Blogging is essential to building trust and respect between you and your prospect. Search Engine Optimization (SEO): Manufacturers are online looking for your products and services. In fact, research shows that business-to-business purchase decision makers are already 57% of the way down the path to a decision before they’ll actually perform an action on your site. Keyword research is essential in determining how your prospects are searching for your products and services. Then, by optimizing your website, creating content, and building links around those very keywords that your prospects are searching for, you can attract them to your website. Web Pages: Manufacturers often discredit the power of a website, often commenting “I don’t think my buyers are online” or “I only have a website because everyone else does. It doesn’t really get me leads.” That couldn’t be further from truth. Your webpages are essentially your digital storefront. It is one of the most important tools to showcase your expertise. A great website levels the playing field between you and your competitors and shows prospects why they should buy from you instead of your competition. You only get one chance for a first impression. Optimize your pages with keywords to attract people to your website, provide valuable content and watch the traffic on your website increase. Social Networking: Social is an important tool to entice your buyers and build relationships. By providing relevant content, both original and curated (content from a source other than yourself), you can engage with your prospects, and share information significant to your prospective buyers. or an offer for a free demonstration are examples of offers that prospects could see as valuable enough to exchange their contact information. It is essential to create multiple conversion paths on the website to gather information from visitors hitting your website. Forms: The way visitors on your website become trackable leads is by filling out a form and submitting their information. Optimize your forms to make the conversion process as easy as possible. Remember, the length of a form on your website should match the value of the content provided. If you are just offering a subscription to your newsletter, the form should only request the person’s email. However, if you’re offering a white paper, asking for more detailed information; such as name, email, company and job title is acceptable. Manufacturers are reluctant to give their information so start small. Once you get a prospect to database themselves through a form, you can track their behavior. The core of converting prospects to leads starts with getting their email. Calls-To-Action (CTAs): CTAs are essentially links or buttons that encourage your prospects to take an action. Examples include: “Download Our Free White Paper” or “Yes, I want to attend the Additive Manufacturing Seminar”. To generate leads, you must have multiple, enticing calls-to-action on your website to intrigue your prospects to take action and database themselves, in return for an offer they find valuable. Landing Pages: Once a visitor on your website clicks on a call-to-action, they will be directed to a coordinating landing pages. A landing page is essentially a web page where the call-to-action is fulfilled. The prospect will get more information about your offer and then will have an embedded form where they can submit their information to receive the offer. When the visitor fills out the form on your landing page, that visitor is now a contact in your database. Contacts: Keeping track of leads in your database is essential to guiding prospects through the sales funnel quickly and efficiently. Having your data in one central place helps you track every interaction you’ve had with your contacts, whether it be through a landing page, email, social media or other tactics. Then, you can track ROI and determine the best way to improve future interactions and attract, convert, close, and retain your buyer personas. “Nothing happens until you sell something”. This old business saying still rings true. Once you’ve attracted the right visitors to your website, you need to put in the effort to convert leads to customers. How can you close sales quicker? By using the marketing tactics below to close qualified leads on their terms, when they’re ready to buy. Customer Relationship Management (CRM) – A CRM is essential to tie your sales and marketing efforts together. You can get a 360 view of who your prospect is through tracking their interactions through syncing your CRM with an inbound marketing platform. Don’t have a CRM? 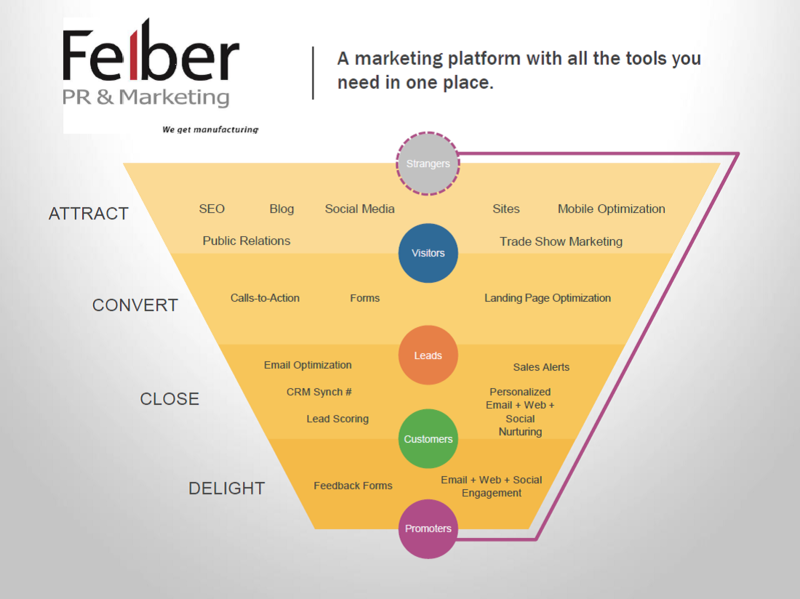 HubSpot offers a free CRM through their platform. How many times your prospect opens and click your emails, what web pages they visit and so much more. You will gather more information about the prospect, empowering your sales team with insight on the needs, wants and goals of your now qualified lead. Your sales team is now equipped to answer their questions and provide solutions. Email: What’s the next step if a visitor databases themselves on your website but still isn’t ready to become a customer? Email is the best way to create a stronger connection with prospects. By sending targeted email, sharing useful content relevant to your buyer personas industry, you build trust. Track their behavior with your brand and send content focusing on the pages and piece of content they’ve viewed. Marketing Automation: You’re a manufacturer. Your days are jam-packed between responding to customers, managing inventory, solving a technical issue and the list goes on, and on and on. Maybe you want to streamline your marketing efforts and want your sales team to be more engaged with prospects hitting your website but you’ve got more projects than time. That’s where marketing automation kicks in. Marketing automation allows manufacturers to create email marketing and lead nurturing based about where your prospects are in the sales cycle. For example, if your prospect downloads a white paper or visits certain pages on your website, they are automatically sent an email based upon the pages or content they are consuming. The inbound methodology is all about providing outstanding content to your audience, whether they are visitors, leads, or current customers. Just because someone is a current customer doesn’t mean you can forget about them. Think “go wide and deep” with existing customers. With an inbound marketing strategy, you can engage with your customers, build stronger relationships and (hopefully) make your current customer base your brand ambassadors, or people who will participate in case studies or refer you to other companies. Social Monitoring: Tracking your customers’ social media engagements is a great way to keep tabs on your customer. Watch your customers’ comments, likes, and dislikes. Then, you can reach out to them with additional, relevant content. Also, it is essential to engage with your customer on their social media platforms. Like and comment on their networks and show them you care. What is this all called you ask? Social Selling. Read about how to perfect your Social Selling strategy on LinkedIn here. Surveys: The best way to determine your customers’ wants, needs, and goals is by asking. Send routine surveys and ask for feedback to ensure that you’re fulfilling your customers and adjust. Surveying is a great way to show you care about your customers and keep them happy by giving them exactly what they desire from your company. “Smart” Content: Smart content presents your prospects and customers with offers that change based about who the buyer persona is and where they are in the sales cycle. Yes, the questions asked actually change based on their behavior! Smart content is a valuable tool to introduce new or related products and features to them that might be of interest. This is a great way to show your value in the industry. Look at your sales data. If someone needs X product, do they also need Y? Smart content is essentially the Amazon way. It’s all about tracking behavior and sales data and getting your customers wanting more.